These questions pertain only to Hot Wheels Skating & Birthday Parties. If you have questions about after school care or our day camps, please call us 251-626-5120. What time are you open? Our summer, winter and school holiday schedules vary. Please refer to our skating schedule for exact session times. We typically follow the Baldwin County School System schedule. What all do you offer? We offer a variety of activities, along with roller-skating. In addition we have an arcade, full service concession area, stuff shop novelty items and pro-shop. The admission price varies by each skate session. You are welcome to bring your own roller skates or inline skates. If you do not have your own skates, skate rental will be an additional fee. Do adults have to pay admission? We do not charge non-skating parent adult chaperones. We do charge for all children under the age of 18 to enter the building, this includes non-skating children. If I have a free admission pass does this include skate rental? No, skate rental is an extra fee. Any minor entering the building must either rent skate or bring their own. If my friends are coming to skate, do I need to pay if I’m only going to hang out? EVERYONE, with the exception of non-skating adults, must pay the admission and skate rental fee (unless bringing in their own skates). This is strictly enforced. If I have my own skates, do I still have to pay admission? Yes. We charge an admission fee to enter Hot Wheels. If you have your own skates you will not be required to pay the skate rental fee. We do not allow “heely” shoes on the skate floor. What size rental skates do you offer? We have 3 different types of rental skates: regular roller skates, speed roller skates and inline skates. We have over 700 pairs of rental skates varying in sizes from a children’s 8 to an adult 15. What are Skate Mates? Skate Mate Skate Trainers are used to help people learn how to skate. We rent them for $5 per session. It’s a great tool and we highly recommend it for new skaters. We ask that you please keep all skate trainers in the center of the rink. Skate Mates are limited and on a first come first serve basis. Do you sell skates? Yes, we offer skates in varying price ranges, including custom ordered skates. Skates are available for children, teens and adults. Skates take 3-5 business days to come arrive after the order is placed. Do I have to book a party in advance? Yes. We routinely sell out on weekends, we suggest you make your reservations as far in advance as possible. How much are the arcade games? Games vary between 1-4 tokens. All of our games take Hot Wheels game tokens. What type of food do you offer in your concession area? We generally offer hot fresh pizza, chicken tenders, French fries, mozzarella cheese sticks, jumbo pretzels, funnel cakes, hot dogs, corndogs, nachos and cheese, popcorn, icee and pepsi products. What payment types do you take? We accept Cash, Visa, MasterCard and Discover. We do not accept checks for skate sessions, birthday parties or pro-shop items. We do not have an ATM located in our facility. Can I rent the rink out? Yes, we offer private parties when we are not open to the public. Our facility can be rented for Sweet 16′s, Corporate events, School field trips, School fundraisers, Surprise Parties and Meetings. Please contact us at 251-626-5120. Do you sell socks? We do! Socks are required to rent our skates. You can purchase socks at the Stuff Shop. Do you sell gift cards? Yes we do! 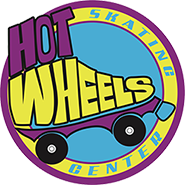 Hot Wheels gift cards can by used for anything in the facility, this includes admission, skate rental, concession items, stuff shop items, pro-shop items and game tokens. Can I drop my children off or do I have to stay with them? Hot Wheels is a clean, fun, friendly and SAFE facility. As a parent, it is your decision if your child is old enough to be left unsupervised. We do everything possible to keep all of our patrons safe at all times, however, we cannot stop a child from leaving our facility. Please remember, we are open to the public. Is there a dress code? Yes, we do enforce a dress code. We do not allow saggy pants, short shorts or offensive T Shirts. Please dress accordingly. Do you offer skate lessons? Currently we do not, however we are looking into finding a good instructor. Please check back with us.